While I know this may not be the best place to post this, moderator I apologise, but it is kind of a last ditch effort on my part. I have a Nexstar 80 that I am putting bits and pieces together so that I can give this to a grandson, it has the origional GT hand controller which kinda a works. I want to update it to the 4, the + will not work, so I am looking for a solution to this if possible. Edited by junomike, 12 July 2018 - 04:54 PM. Did you place a Wanted ad in CN classifieds? If this is indeed true then you can take any V4 hand controller from any scope/mount (eq or alt az, it won't matter) and with the Celestron HC serial cable, serial port, Windows PC, and the HCUpdate.exe software re flash the hand controller to v4.03. We'd need Mike or someone else with knowledge of the NS80 firmware to verify the version information and any pre requisits, but this should mean that you will be able to find a hand controller much more easily (and hopefully in good condition). I have an add in classifieds. No response so I'm looking for other possible options. Appreciate the point to the eBay add, when I checked eBay nothing showed up except +'s. Oh, and Mike, it is your Nexstar Resource site I have been looking at and has guided my hunt. Great resource and I for one very much appreciate the effort. It's your site that makes me think I need a smaller grab and go scope and also I must admit even though I would like the upgrade how pressed I have.been with the Nexstar accuracy. As far as purchasing a HC, I've used these guys several times with great results. https://www.ebay.com/str/wingandsons Sometimes they post adds on amart & CN. They'll even load the firmware you want. My specific model/version is "custom". So really can't id it further than that. Celestron has been no help, but not that they haven't responded just that they don't seem to have historical records that matches the type of support I am getting here, again thanks Mike. I did send a request for info to the ebay seller but no response. Since I have to teach the grandson, need to learn myself and your help is invaluable. Thanks one and all and a special thanks to Mike. Now my question would it work to switch h out the origional for this? You went to what I was thinking ... it's faster and might even be cheaper to get an entire newer model GT mount with the HC than finding a good condition V4 hand controller of any type. You'll just need to figure out the connection between the ota (tube) and the mount. Can you post some pictures of what you currently have? I remember seeing your "custom" firmware comment in an earlier thread ... and went "uh oh". Ok so uploaded 4 pics. He typically sells just the HC for $40 + $5 shipping, you may need to ask if it's not listed but I believe he has crates of them. I can't answer HC compatibility questions. Note that those mounts do not include the normally needed base piece (tripod to mount I/F). Well I made an offer, which he declined. This is a risk purchase. As while the base seems compatable but will not know until I try the arm, is different, how ever it is held in by a nylock nut so may be interchangeable. I suspect he will decline this offer as well. But worth a try, just not real big bucks worth. You have the original (somewhat buggy) GT hand control which I covered in the first review I linked to above. As far as the 102GT mount and hand control, you would end up moving your existing tube ring to the slightly larger fork arm which would leave the gear teeth exposed to collect dirt on the grease. I'd say give it over to the grandson and keep an eye out for a version 4 hand control as a future upgrade. Thanks Mike, appreciate your continued interest and will do just that. And use some more of the Velcro to attach the hand control as shown in that same picture. Use the "hook" part of the Velcro on the mount and the fuzzy part on the power pack and hand control. I have purchased several Nexstar mounts and HCs from Wing & Sons. They have been very good to deal with. I would not hesitated to do it again. Mike, great simple hacks/ mods for the Netstar. Will impliment. I'll continue my search for the 4 hand controler, but since origional controler works will just wait. So grandson's gift works, and he will get his scope in 2 weeks. Thanks everyone for your suggestions and assistance. It's people like you that make me love Cloudy Nights. 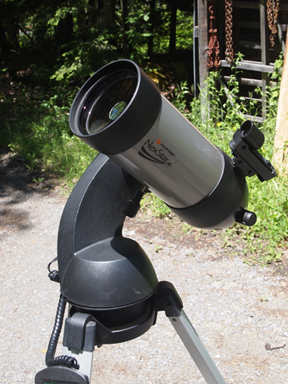 I suspect that in a couple of weeks I'll be back asking for your input on a Nexstar grab and go scope for me. I bought two of the 6000 "no name" Ebay versions from China 3 years ago. Aside from charger issues, they are working great until the other night. I pluged it into my 6SE and nothing. The red light on the battery was on and it was charged but no power to the scope. Fearing the worst, I went and got the connector from the other battery and that worked fine. So I figured the cord was the problem. I checked it with an Ohm meter and the negative side had a short. I cut it in half to see which end was bad. I was a bit shocked to see how TINY the wires were. They are smaller than a human hair! Probably 30 gauge or even smaller. Luckily I bought some spare Male/Female plugs for projects a while back so I'm making new cords for BOTH of them. Just be aware that they are REALLY delicate and I'd recommend swapping them out. Thanks for the heads up. I have a "China" knockoff and purchased a new cig lighter to 5.1 DC plug for it. Because of the heavy need for dew heaters here in the SC low country upgraded to larger. This battery should do him ok, at least for now. I have fitted those mods that will eliminate the wire wrap, and thanks again for that suggestion. I'd say go with the Wing & Sons' GT mount and save yourself some headaches. BUT the problem you have is that your current tripod hub is too small to work with the GT (I think C is now calling these mounts the "Cosmos GTs"). I've done a lot of business with this seller and they are quite reliable. 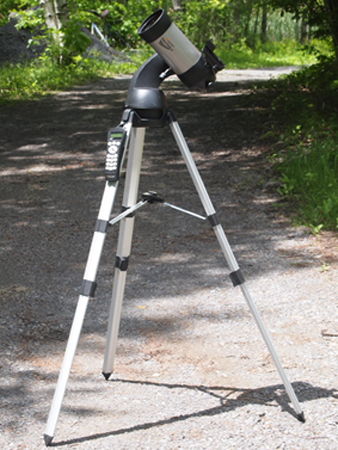 The Meade DS2000 tripod can be adapted to the Cosmos GT. It is fairly easy for me to update these early GTs (114, 130, N4) to the Cosmos' electronics including the Plus HBX and the Cosmos' dovetail saddle. But the 60/80's gear ratio is not supported by the Plus. So the only upgrade path is the Ver. 4 HBX. I bought 30 damaged HBXs from Wing & Sons that included several Ver. 4s. I was able to repair many of them with parts from dead GT HBXs. They sold very well. I may have a working unit. PM me and I'll take a look. We'll that is very kind of you to be willing to make that effort. However, just (5 minutes ago) made a purchase of a V4 off eBay. If this fails to work, I hope not, I'll get back in touch with you by message. These older versions are becoming scare as hen's teeth. Thanks again and I'll be in touch. Glad I read this article, Mike. Not sure why I didn't check it out earlier. I've got a 6000mAh power pack arriving shortly in the mail but thinking I will return it and put out the $$$ for the larger capacity 8300mAh power pack because I am running the 8SE mount, StarSense and wifi module. Better safe than sorry. I'm just so tired of having to run around with the large battery booster to keep it from getting tangled... and unplugged... in the middle of an observing session.